Yep. The Great Unpredictable British Summer is on a roll. 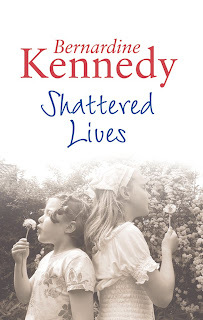 Since I last posted, I've received my copies of the Large print version of Shattered Lives. I really like this cover, what do you think? Eye-catching enoough to fly off the library shelves? Still waiting for news and views of the Portugese edition, I'm looking forward to seeing the cover and getting a publication date and then its fingers crossed for sales. It's my first time in Portugal so it will be interesting to see what happens. My latest, 'Whatever the Cost' is generally coming along okay (??) although I am finding it heavy going right at this moment, so heavy that I'm well into any Work Displacement Activity that comes my way. I tell myself that watching daytime TV and reading trashy mags is good research but I know that I'm putting off the moment of 'moving the story along'. Hopefully it'll start to flow again soon. Take no notice, 'where do I go next?' is my regular cry as I sit front of the screen! In the absence of anything exciting enough to make you all sit up and take note here's a piece I did for someone else's blog, 'meandmybigmouth' (link to the blog is below). Let me know what you think. Right now I’m tearing my hair out trying to write a couple of personal press releases that can be sent out to the media to prove that I’m really very interesting and worthy of a few column inches that will help promote my next book. You know the press releases I mean, they delve into the personal rather than the professional and are written to catch the jaded eye of the journo assigned that day to sifting through them all. Once the crack-high of acceptance and publication has died down, there comes a stark realisation that the next step for one’s lovingly crafted book is for it to actually sell in enough numbers to keep the publisher happy. The loyal purchase of the first book by family, friends and curious colleagues (after the debut they lose interest) just won’t do it; the book has to be lobbed forcefully out into the big wide world and the general public have to hear about both it and the author and then they have to be persuaded that they really, really have to go out and buy it. Complex stuff. This is where publicity and self promotion comes in. Publishers and agents will do some of the touting around but on the whole it’s down to the author to try and fire up some interest. Any interest. Self-promotion is a necessary evil that even the most shy and retiring has to get to grips with but it can be a dangerous balancing act trying to find the happy medium between being ordinary and uninteresting and giving out ‘too much information’, some of which is possibly (accidentally?) exaggerated and which will one day return to bite the author on the bum. Trust me, there’s always someone somewhere ready to rain on your parade. So just how much personal information should you give out about yourself and your nearest and dearest in the quest for that ever elusive publicity? Where does a Joe Bloggs author, not normally in the public eye, draw the line between doing everything possible to get mentions and quotes, and going too far? It seems to vary greatly from person to person; I cringe sometimes when I read an in-depth confession of something so deeply personal, tragic, humiliating or devastating it brings a lump to my throat and then see the little note at the bottom of the piece about the authors latest book that is out that very week. Cringe I might but at the same time I can understand it. Authors want their books to sell and so do their publishers but in these days of gossip magazines and tabloid newspapers publishing increasingly salacious details about celebrities, being normal, ordinary and hard-working doesn’t cut it. ‘Happily married mother of two point four children who lives in a semi and works part-time in a bank writes a novel’ isn’t going to grab any headlines unless she was moonlighting as a high class call girl at the same time. (N.B.High class call-girl is good, heroin raddled street walker is bad). Same as ‘Disabled dad whose wife ran off to Turkey with a toy-boy leaving him with five kids managed to find the time to write a heart-rending account of his struggle when they were in bed’ will have them all gagging for the details. Especially if the wife now wants her share. Bring on the tabloids! So would I tell tales on my kids to get a two line mention at the bottom of a page? Would I rip into my ex-husbands who are also the fathers of said kids? Reveal personal details about my childhood, adolescence and marriages that will embarrass not only me but also everyone close to me? No I’m sure I wouldn’t. Well I haven’t done so far. But would I drag up something from my past that makes a good tale, doesn’t impact on anyone else and won’t come back to haunt me? Oh Yes. All I have to do now is think of something catchy! Back to the drawing board of my ratchety old past! 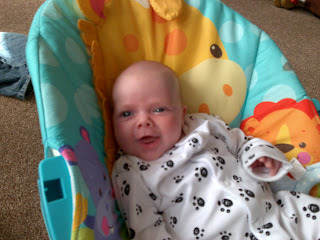 To sign off here's the latest photo of the gorgeous Riley laughing his little socks off at only one month old. Clever little boy! Bet you though I'd been abducted by aliens. Icons on furniture and fittings!